Add one bottle of ESSIAC® to 88 fl oz (approx. 2.5 liters) of water in a covered vessel. Use filtered, distilled or spring water. Use stainless steel or glassware. Do not use an aluminium vessel. Bring to a boil and then reduce to a simmer for 10 minutes, stirring occasionally. Keep covered during this process. Remove from heat, keep covered and let stand for 4 hours to increase potency. Bring to a boil again and then reduce to a simmer for 5 minutes, stirring occasionally. Keep covered during this process. Remove from heat. Scald, or dishwasher clean, a tall narrow container and pour in the ESSIAC®. Cover, refrigerate and let stand overnight to increase potency. A small amount of sediment may be present in the final ESSIAC® tea. Keep refrigerated. Do not freeze or microwave. One bottle (1.5 oz) of ESSIAC® Powder makes approx. 72 fl oz (2 liters) of ESSIAC®. 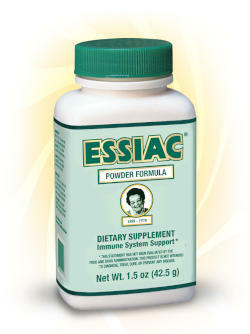 Unopened bottled ESSIAC® Powder formula will keep for approximately two years. Once the ESSIAC® has been prepared, it will retain its potency and freshness for approximately 6 weeks, stored in the refrigerator.